I absolutely love sage brown butter sauce, but hadn’t made it in a really long time. Thankfully, it’s back in my memory now, and will probably make an appearance more often. If you’ve never had sage brown butter sauce, this is a great opportunity to try it, and let me tell you, you’re in for a real treat! 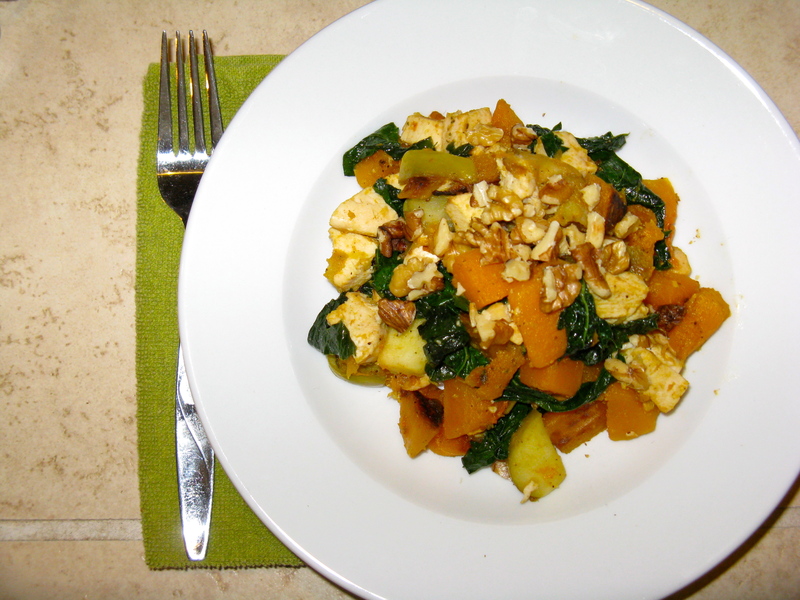 It tastes amazing with this fall sauté, but is wonderful with many other things as well. Heat ghee in a large skillet over medium heat. Add the butternut squash cubes and season to taste with sea salt and pepper. Sauté for about five minutes, stirring occasionally. Add the apple pieces and continue to cook for about five more minutes. Meanwhile, heat butter in a small skillet over medium-low heat. Once melted, add the sage leaves and cook until the sage is crisp, about five minutes. Watch closely, so the butter doesn’t burn! Once done, remove the crisp sage leaves and set aside. 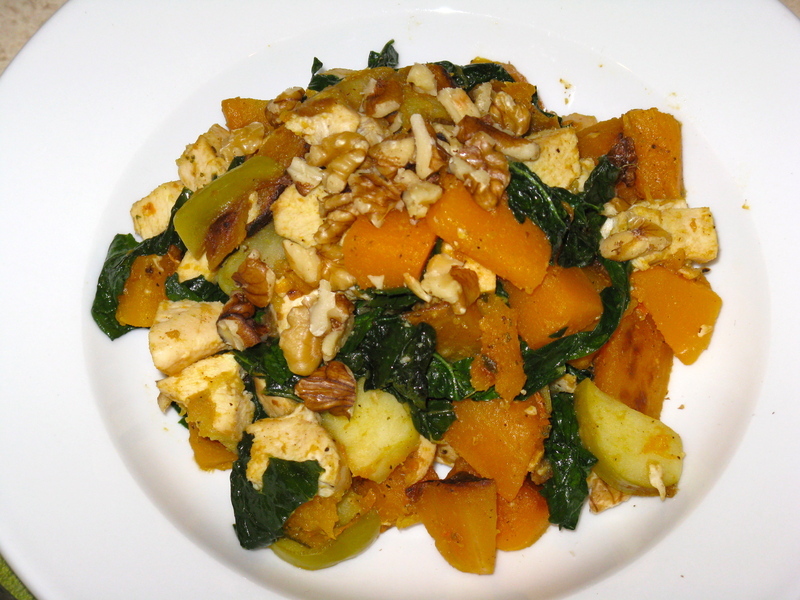 Add the chicken breast pieces and kale to the squash and apple mixture. Add a bit more sea salt and black pepper to taste. Once the chicken is warm and the kale softened, remove from heat and pour the brown butter sauce over top. Crumble the crispy sage leaves into the sauté and mix well. Serve with chopped walnuts on top, if using. Yes, I can imagine it would! I hadn’t made this sauce in so long either. It’s SO good! That looks delicious and I bet it tastes awesome, too! Next time I have chicken, I’m trying this recipe out! Sounds awesome! I applied for a garden plot in my neighborhood and am praying that come March I get a letter saying I’m in. I NEED to start growing my own herbs and veggies so recipes like this are more feasible! I hate buying fresh herbs because they are so pricey and then go bad!! This looks / sounds awesome!! -Side note, what can you substitute ghee with / what is it? Ghee is butter that has all the milk solids removed from it. I make my own — super easy. You skim all the solids off the top and then drain the butter through cheese cloth. It’s also called clarified butter. Many people who don’t tolerate butter can tolerate ghee. You can buy it in the store, but it’s expensive and cheaper to make it at home. You can sub butter for ghee. I hear ya on the herbs … I really need to grow my own too!